A day or so ago I posted about a close approach by 2010 KQ, a small asteroid only about 2-6 meters across. KQ is not the only small asteroid to buzz the Earth recently. 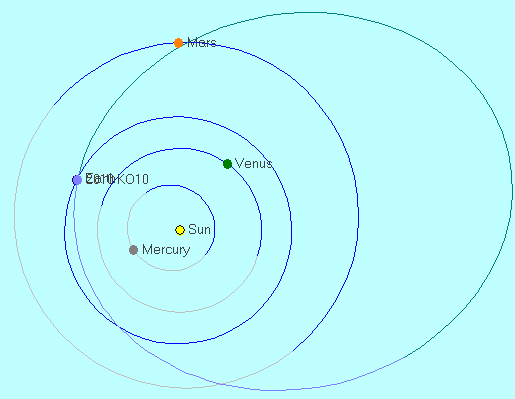 Two more asteroids, 2010 KO10 and 2010 KV39, are in the vicinity of Earth and both get much closer than 2010 KQ. Both asteroids will safely miss the Earth and don’t pose a hazard. 2010 KO10 was first seen by Rik Hill of the Catalina Sky Survey on May 20.32 UT. The 6 to 25 meter in diameter space rock passed within 112,000 miles (0.0012 AU or two-thirds of the way to the Moon) on May 23.2 UT. At its brightest it got up to 14th magnitude, possibly putting it in visual range of very large amateur telescopes. Orbit of 2010 KO10 and the inner planets. Created with C2A. Credit: Carl Hergenrother. Last night (at around May 24.37 UT) the Catalina Sky Survey (this time with Alex Gibbs as observer) picked up 2010 KV39. Tomorrow night at May 26.9 UT, 2010 KV39 will pass within 160,000 miles of Earth. Though similar in size to 2010 KO10, KV39 will only get as bright as 16th magnitude. 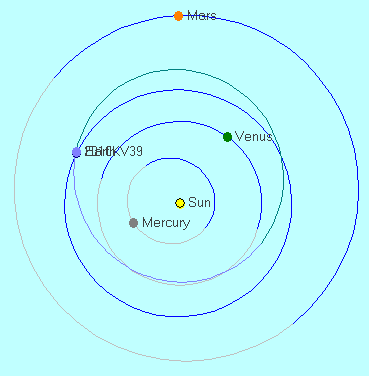 Orbit of 2010 KV89 and the inner planets. Created with C2A. Credit: Carl Hergenrother.